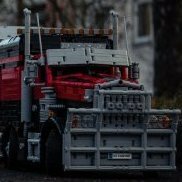 [MOC] Small 4-axle mobile crane - finished! It looks so good, I like the chassis and the placement of the outriggers. I agree the pneumatic cylinder is too "heavy" by its self but when you operate with some phone, which weight is around 200g, they are almost in equilibrium. Yes, that's what LEGO is about. All lego technic sets are more expensive, complicated and they work worse than cheaper not lego models. 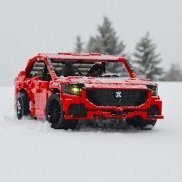 For example RC cars: You can pay a lot of money and buy some Lego RC car, but it will be never that fast and powerful as normal, cheaper RC car, for example from Wallmart. Thanks but I don't understand why its a problem? Can you better explain me? I donť know any black 1/2 axle. Can you tell me which one did you mean? Thanks, I really like it, because it is compact and it has a much better range than the standard one. Why? I think, that it looks good and its easy to make.